By combining their expertise and resources, these two industry leaders are enabling mutual clients to leverage award-winning mass communications technology with experienced and respected security consultancy. 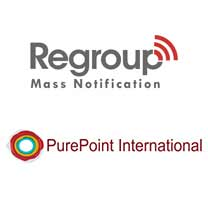 Regroup Mass Notification, the award-winning leader in emergency and mass notification technology, and PurePoint International, experts in safety and security, have entered into a new partnership that will provide organizations with the technology and thought leadership necessary to create a safe and secure work environment. “We help executives and leaders create an empowered and safe workplace, decrease risk, liability, and create a consciously secure life at work for their employees. This partnership with Regroup means that our clients will now be able to communicate more effectively — whether it be an emergency alert or an important daily announcement — with their employees across multiple channels. This increased level of connectedness and information sharing is essential to workplace safety and security,” said Jessica Robinson, Founder and CEO of PurePoint International. Regroup’s powerful, yet easy-to-use mass communications platform is used by universities, state/local governments, corporations and nonprofits across North America to streamline emergency and day-to-day communications. “We’re thrilled to be partnering with Jessica and her team at PurePoint International. They take a thoughtful and holistic approach when it comes to analyzing and evaluating an organization's security risks. Through their security risk assessments, they are able to develop a detailed security protection and prevention plan that will ensure the safety of employees and the continuity of business. We see this as a valuable service that, when layered with our mass notification system, will create a safer workplace environment and enable employees to thrive,” said Joe DiPasquale, Regroup’s CEO. To learn more about how Regroup’s Emergency Notification System can provide rapid communications during a crisis, as well as streamline day-to-day communications, call 917-746-6776 or email inquiries(at)regroup(dot)com. Headquartered in New York City, as a mission driven company, PurePoint International is disrupting the security market by providing affordable training and outsourced Chief Security Officer (CSO) consulting services to commercial enterprises and non-profits. To learn more about how PurePoint International can make your organization safer and more secure, call (929) 800-1184 or email info(at)the-purepoint(dot)com.